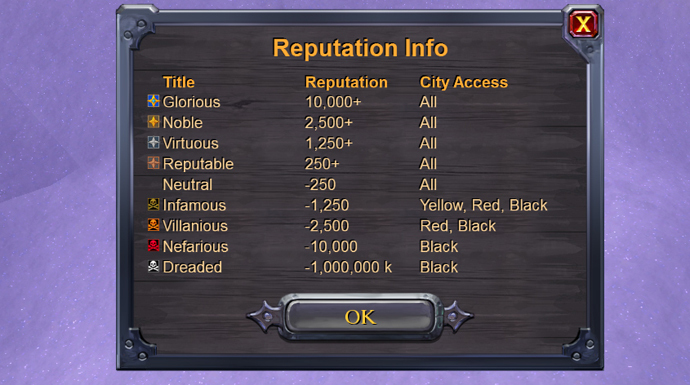 With the start of Final Beta, the new reputation system will be implemented into the world. This system measures how a player is seen by the Royal Expeditionary Forces and how well they follow the King’s Law. Will you become a model citizen, who would not dare to think of attacking a fellow adventurer? Or are you a criminal, killing others and happily stealing their gear? The choice is yours! No time to watch the video right now? Here is a written summary of the new crime and reputation system! On the Royal Islands, the Royal Expeditionary Forces make sure everyone abides the King’s Law. Whether you are on their good or bad side is reflected through your reputation. Players who live a peaceful life, gathering resources and helping to make the lands more safe by clearing them of dangerous creatures and natives, will become model citizens. Adventurers who decide to ignore the King’s Law and attack, murder and loot as they please, will be condemned to the life of a criminal. Your actions will give you either positive or negative reputation value, which determine your reputation level (high to low): Glorious, Noble, Virtuous, Reputable, Neutral, Infamous, Villainous, Nefarious or Dreaded. Your reputation level is displayed with an icon next to your name, with a star for good citizens and a skull for criminals. 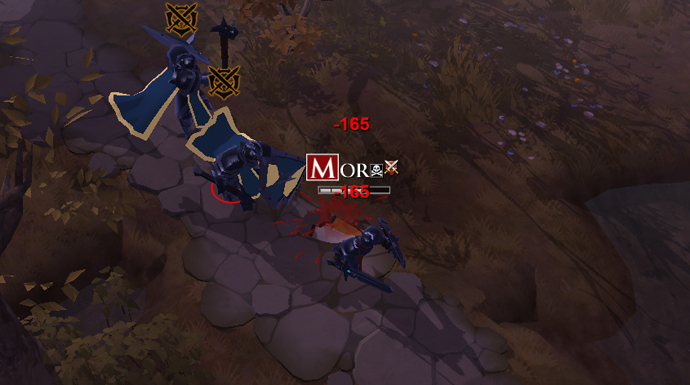 Your behavior and actions in The Outlands will not affect your reputation value and level, as the Royal Expeditionary Forces are not present outside of the Royal Islands and cannot enforce the law. Nonetheless, your reputation will still be visible in The Outlands. In the current state of the game, different types of players are in the same place in the world, causing them to clash frequently. 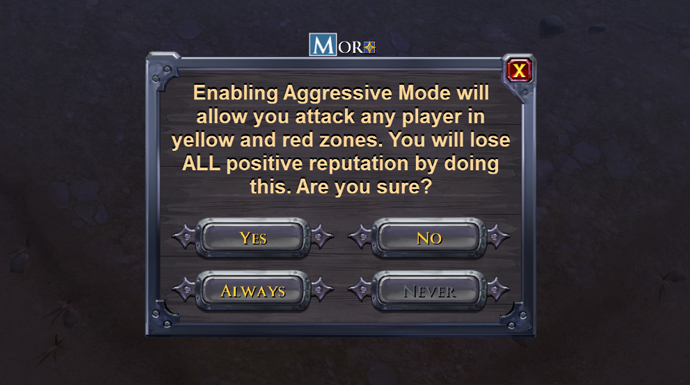 This often leads to players having little choice on how they behave, especially in yellow and red zones, resulting in a ‘kill on sight’ mentality. In order to give players more choice and freedom in their playstyle, we introduce the New World and Reputation system. Guilds and players who prefer to play in big groups can conquer The Outlands, while those who prefer a more casual-style of PvP are better off on the Royal Islands, where they can find like-minded adventurers based on their reputation level. Those who do not like to PvP at all, will have an easier time avoiding dangerous players and finding trusted companions. 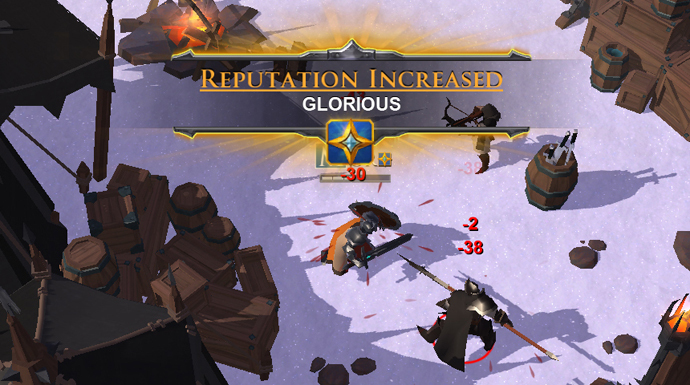 Adventurers can gather a positive reputation by killing mobs and gathering resources. While there are no specific buffs for model citizens, there are two big advantages to having a positive reputation. First of all, you will automatically gain trust from other players. As your fellow adventurers can see your reputation next to your name, they can see you are a safe and friendly player. Secondly, a positive reputation somewhat protects you from other players. Attacking, knocking down and/or executing a good citizen will result in a significantly high reputation loss for the attacker(s), which is not a risk everyone is willing to take. The King’s Law does not forbid self-defense and you are free to retaliate to criminals who ambush you, without your reputation suffering. In order to start your life as a criminal, you first need to flag up for battle. By doing this, you automatically renounce the King’s Law. If you had a positive reputation before flagging up, you will lose all of it and become Neutral. Unflagging will not give you back your previous reputation level, so think carefully before you flag up! How much reputation you lose for your criminal behavior is based on both your actions and your target. 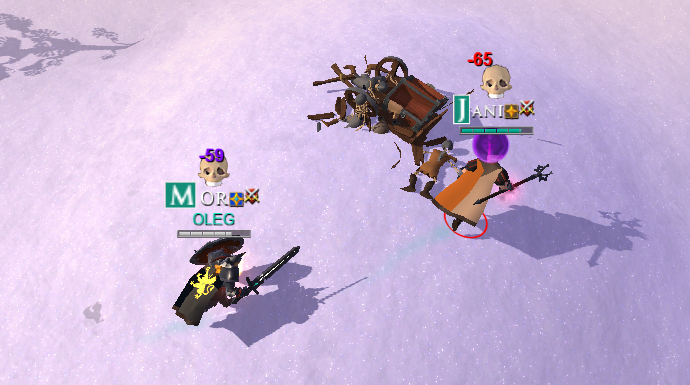 Attacking a player will result in less reputation value loss than knocking them down, while executing someone will take the heaviest toll on your reputation. Attacking, knocking down and/or executing a good citizen will result in a significant loss of reputation, while doing this to a neutral player will end in minimal loss of standing. Attacking, knocking down or executing a criminal does not result in any reputation loss. It is important to note that all attackers get punished equally! If you assist a player in executing an innocent citizen, you will experience the same reputation loss as the one who performed the execution. Assisting does not just mean dishing out damage, but also includes healing and any form of support. Even if your victim is finished off by a wild creature, their death is still on you and you still bear the consequences. The further down the path of a criminal you go, the more things will change. Not only will players find it harder to trust you, you may also find yourself locked out of certain cities, attacked by guards and unable to increase your reputation. Luckily, the Royal Expeditionary Forces have a bad memory, and your reputation level can go up again over time, as long as you don’t continue breaking the King’s Law. Despite the Royal Faction hunting you and other players distrusting you, there are advantages to being a criminal. You are free to do as you wish, you can make others fear you and most importantly: you can steal other players’ items! Why purchase that expensive Sword from the Marketplace, when you can grab it for free? That is, if you can handle being an immoral criminal without a conscience. While the Royal Expeditionary Forces do their best to govern the Royal Islands, there are spots on the islands that are out of their reach and where the King’s Law does not apply. These areas are usually around objectives that awaken the adventurer’s greed, such as treasures. Once you enter said zone, you will get a warning that you are entering an unrestricted PvP area, after which you are free to attack, knock down and kill other players on sight, without fearing any reputation loss. These areas are perfect for players who do not want to become a criminal, but still want to occasionally feel the thrill of PvP! You can start choosing your own path on August 1, with the release of Final Beta. Will you become one of the good guys or a ruthless criminal? Let us know in the comments below!